Faustin Linyekula is a dancer and choreographer based in Kisangani in the Democratic Republic of Congo. It is safe to say his country has had a volatile existence over the last century at the hands of colonial exploiters and of its own successive political regimes since gaining independence in 1960. Profits from its vast natural resources have funded bitterly internecine wars that claimed the lives of an estimated 5.4 million people between 1996 and 2003 alone. 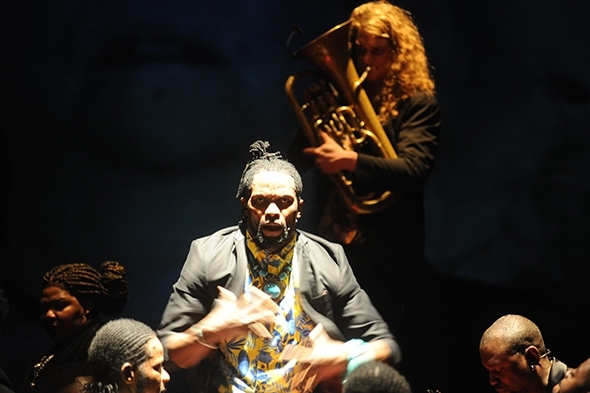 The names of its presidents Lumumba, Mobutu and Kabila have filled newspaper headlines but at The Place in London recently, as part of LIFT’s 2018 program, Linyekula and a handful of colleagues have recalled both the rich complexity of their country and its tortured legacy through the powerful theatrical mediums of dance and storytelling. In Search of Dinozord, as its name suggests, sets out on a journey without knowing if it will find what it is looking for or even what or where it may be. Did the journey really take place? The question is irrelevant, for the journey enters the emotional intensity of memory in which the distinctions between reality and imagination are forever blurred. The setting is visually sparse yet charged with significance. A wide strip of crimson material hangs vertically on the back wall from floor to ceiling next to a large plywood panel; a group of performers huddle around a battered red metal trunk on one side and on the other a man sits in front of a typewriter at a desk in preparation for writing. Linyekula, his face daubed in white, stands behind a low wooden frame waiting to nudge his laptop into action. What he unleashes is the sound of helicopter blades layered into a frantic, screaming cauldron of sound that is Nierica by the French experimental and conceptual composer Joachim Montessuis; Linyekula sings through it, his trembling hands becoming a motif that will later spread to the bodies of his dancers, a fretful image of disease, fear or pain. Nierica is the sonic earthquake of the past from which the present performance can begin: creativity out of chaos. The political history of the Democratic Republic of Congo is never far from the surface of In Search of Dinozord but Linyekula focuses instead, as with his current infrastructure projects in Kisangani, on building a new cultural landscape in which the future can thrive. This was also one of the dreams of his friend Richard Kabako who died of the plague on his way into exile. Kabako was a poet and playwright whose writings are kept in that red metal trunk and some of whose stories are related by Linyekula and singer Hlengiwe Lushaba during the performance. The man behind the typewriter is the theatre director Antoine Vumilia Muhindo some of whose aphorisms are projected on to the plywood screen. Muhindo was sentenced to life imprisonment in the infamous Makala prison in Kinshasa but managed to escape after nine years. And there’s a video appearance on a makeshift screen of another of Linyekula’s friends, the exiled actor and storyteller Maurice Mbwiti. It’s as if the stage has become the ground on which a new history of the Congo and its diaspora is being devised. Linyekula has stated that ‘My only true country is my body’ and it is in the body that the search for Dinozord takes place. 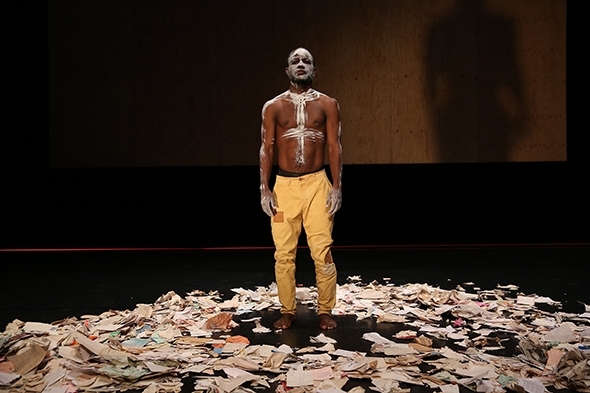 Linyekula convincingly appropriates a predominantly western play list — from Mozart to Arvo Pärt, from Jimi Hendrix to Montessuis — into the bodies of his performers. Pärt’s short organ works are seamlessly worked into the soundscape his three dancers (Jeannot Kumbonyeki, Papy Ebotani and Yves Mwamba) starkly inhabit while Lushaba’s extraordinary vocal range delivers a cappella sections of Mozart’s Requiem that are shorn of all western ecclesiastical references. But it is Kumbonyeki’s response to Hendrix’s Voodoo Chile where the body is transfigured, raising his krumping to the explosive levels of Hendrix’s mastery of the guitar. If Linyekula has honoured the dead with a discursive Requiem, in this final act he conjures up the passion of the Resurrection. In Search of Dinozord is an open-ended performance in the sense that nothing seems finished but what is presented is complete. It takes you out of a familiar, tightly constructed theatrical framework where you know when to laugh, when to applaud and where individuality can so easily become the focus of a performance. This is a broad landscape in which a small group of charismatic performers carry the forgotten dreams of an entire country.